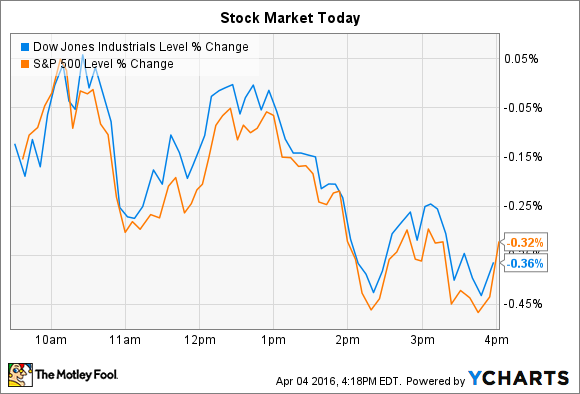 Why these two stocks beat indexes with moves higher on Monday. Stocks only briefly touched positive territory on Monday and ended near their lows for the session. The Dow Jones Industrial Average (DJINDICES:^DJI) shed 56 points, or 0.4%, and the S&P 500 (SNPINDEX:^GSPC) lost 7 points, or 0.3%. In economic news, consumer discretionary spending rose last month to an $89 daily pace , according to the latest Gallup poll. Meanwhile, the manufacturing sector shrank in February, according to the U.S. Department of Commerce, falling 1.7% to mark the third monthly decline in the last four readings . Individual stocks making notable moves included electric car specialist Tesla (NASDAQ:TSLA) and heart-valve designer Edwards Lifesciences (NYSE:EW). Tesla shares rose 4% to touch a six-month high as reservations for its newly unveiled Model 3 surged past 250,000, or more than twice the number of Tesla automobiles sold to date. The reservation total also far exceeds the current existing plug-in car market, which stood at 116,000 vehicles last year. Thursday's announcement by CEO Elon Musk confirmed that the car will start at $35,000 and come with plenty of high-end technology like standard autopilot hardware. The vehicle will also boast a range of 215 miles on a single charge and an acceleration pace of 0 mph to 60 mph in under 6 seconds. But those figures could even be surpassed, depending on Tesla's engineering innovations over the next year. "These are minimum numbers," Musk said, "we hope to exceed them ." The Model 3 is slated for production beginning late next year. Tesla doesn't expect anything close to 100% of those reservations to become actual orders, despite the $1,000 deposit. In fact, the conversion rate could be as low as 25%. Still, the current reservation mark is far higher than executives expected. "No one at Tesla thought it would be this high," Musk said on Twitter. That surprising demand is requiring management to rethink its production planning, and forcing industry watchers to toss out their past estimates of the likely market size for electric vehicles. Edwards Lifesciences was the highest-gaining stock on the S&P 500, jumping 17% to hit a new all-time after the cardiac device specialist announced positive clinical trial news. Its heart valve replacement product was found to significantly reduce the risk of stroke or death as compared to open-heart surgery in a study that followed 3,000 patients over a year. "Results from the [trial] should establish the Sapien 3 valve as the new benchmark for the treatment of intermediate-risk patients with severe, symptomatic aortic stenosis," executive Vinod Thourani said in a press release. The Sapien 3 valve won clearance from the U.S. Food and Drug Administration last July with regard to high-risk patients, and this latest study paves the way for a significantly larger market for this product. Surging demand for its valve replacement therapies helped push sales up 15% last quarter, which exceeded the expectations of CEO Michael Mussallem and his executive team. Management raised their 2016 sales guidance in February, citing "strong performance of all product lines." Monday's news adds to that positive momentum, and points to continued sales and profit growth for Edwards Lifesciences.